If your Internet connection comes and goes, or you're going to be a lot of time offline (due to a journey, for instance), but you need to check some webs, one of the best options is to download a whole web to your hard drive to be able to visit it in the future. 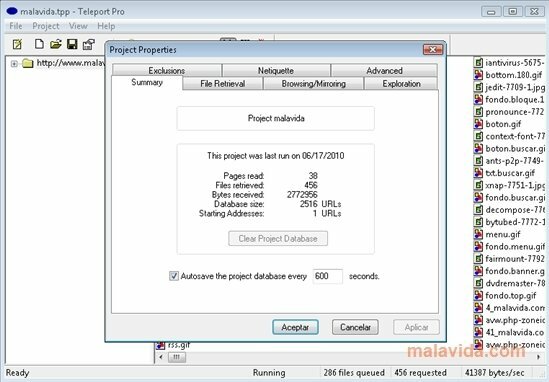 Teleport Pro is a program that can download full websites. The idea behind this software is rather simple, once the program has been launched, it will ask for a project, each project consists in downloading a full website and in it we will be able to configure which website we want and the depth of the links that we would like to have on our PC. Thus, if when we're viewing them we click on any element, the program will also have downloaded the page to be shown. It will be possible to indicate the depth of the links that we want, but we have to take into account that the more links that we indicate, the bigger the download and the longer it will take the program to download them. 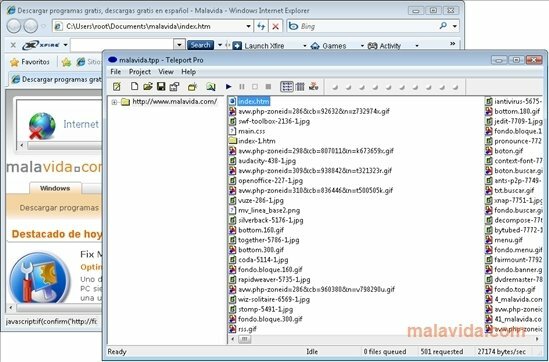 Everything that is downloaded will be easily shown on the browser, which will make the browsing just as simple as usual. One of the advantages (or drawbacks, depending on how you look at it) of Teleport Pro is that it doesn't download some contents, like the adverts generated in Flash, despite the fact that it is totally compatible with HTML, CSS and DHTML.